Some of the chicken, which has eggs which are not listed on the label, was sent to stores nationwide. 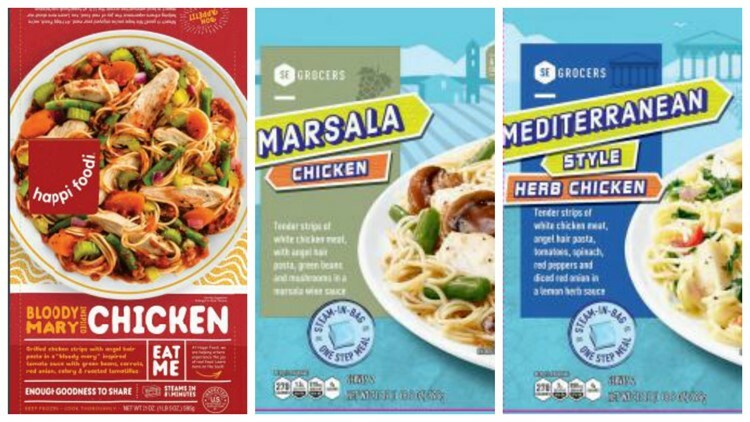 Nearly 50 tons of frozen chicken meals are being recalled because they contain eggs -- a known allergen -- which is not listed on the product labels. VICS Acquisition of Harlingen, Texas, announced the recall Sunday for 99,975 pounds of chicken products. Some were shipped to stores across the country while some were only distributed to parts of the southeastern U.S.
1.5-pound packages containing one frozen steam bag meal of “happi foodi Bloody Mary Inspired Chicken" were distributed nationwide. The recalled packages have lot codes 14528 and 15092 and use by dates of March 2, 2020, and April 15, 2020. The following two products were sent to locations in Alabama, Florida, Georgia, Louisiana, Mississippi, North Carolina, and South Carolina. 1.5-pound packages containing one frozen steam bag meal of "SE Grocers Marsala Chicken" with lot codes 14177 and 14532 and use by dates of Feb. 8, 2020, and March 3, 2020. 1.5-pound packages containing one frozen steam bag meal of “SE Grocers Mediterranean Style Herb Chicken” with lot codes 14145 and 14531 and use by dates of Feb. 7, 2020, and March 4, 2020. The company said there had been no confirmed report of adverse reactions due to eating the chicken. Anyone who has the chicken is advised to throw it out or return it to the store. Packaging for happi foodi Bloody Mary Inspired Chicken, Southeast Grocers Brand Marsala Chicken and Southeast Grocers Brand Mediterranean Herb Chicken.